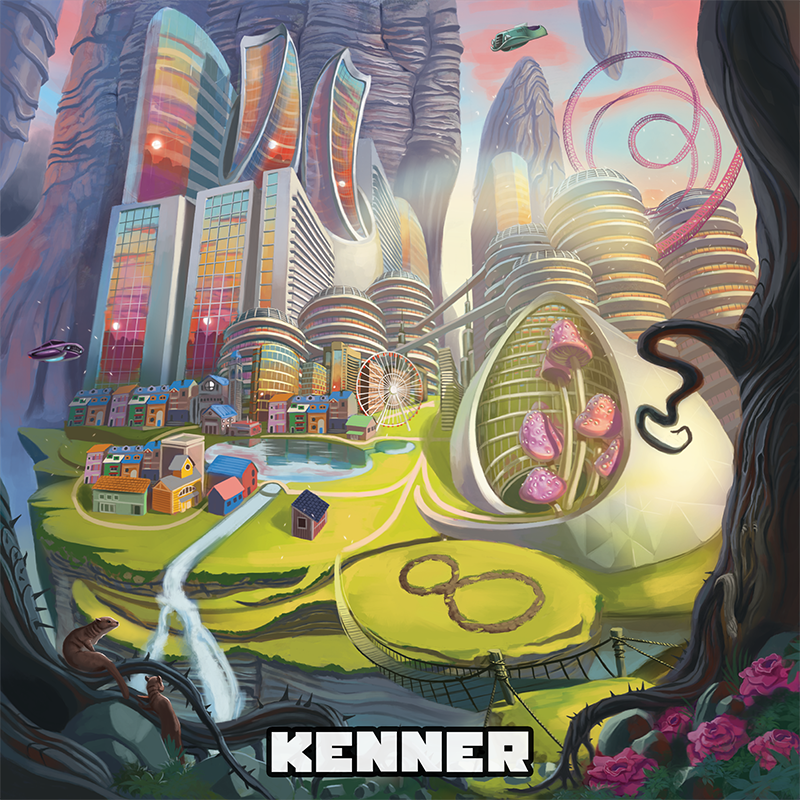 Although the promotional material indicates that keyboardist/producer/composer Eitan Kenner was experiencing personal turmoil during the creation of 8Ball City, the music is upbeat, almost giddy. Helium powered synths spin out surging melodies against compound rhythms and chord progressions climb ever heavenward. Call it “happy prog,” complex, cheerful music that nods to Frank Zappa without getting clenched or sarcastic, apes Yes just a bit but never gets ponderous (and eschews vocals). “Toy Soldiers” is the most complex and developed piece on offer. The insistent rhythms and stair-step hook of its main theme almost impel the listener to do calisthenics, but the piece ends on a quiet note and the song as a whole travels more emotional ground than the other pieces on offer. Some tracks here are more sketches than fully fledged songs: “Life (Small),” “Press Start to Play,” “Behind the Trees,” “Play / Sad Mario,” and “Weasel Pond” all clock in well under two minutes, with “Press Start” and “Weasel” under a minute. These bite-sized episodes aren’t tossed off, however: you can imagine their ideas developing much further if Kenner chooses to expand them in the future. Kenner lists his influences as including classical, progressive rock, jazz, and R&B (the least evident strand in the mix, though the mellow “Janelle” may be a nod to futurist R&B singer Janelle Monae). References to pressing “play” and Mario indicate an interest in video games as well, though the album’s roots are more proggy 1970s than chip-tune 1980s. Whatever the ingredients, the resulting cocktail is effervescent enough to overcome a sense that many of the musical gestures are familiar from the bell-bottom decade. The relatively short performances keep 8Ball City light on its feet, all the more impressive as Kenner relates obsessing over the content of each track to the point it threatened his mental health. You’re likely to be happier after listening to 8Ball City than you were before. Track Listing: 8Ball City; Janelle; Life (Small); Candyland; Press Start to Play; Toy Soldiers; Behind the Trees; Skrunk; Play / Sad Mario; Weasel Pond; Life (Big); Done. Personnel: Eitan Kenner: keyboards, compositions; David Frazier, Jr., Noam Israeli, Diego Joaqu: drums; Tamir Shmerling: bass; Andrew Whitbeck and Nitzan Bar: guitars; Clay Lyons, Jonathan Greenstein: saxophones; Wayne Tucker: trumpet; Jamey Haddad: percussion; Tamer Pinarbasi: qunun.